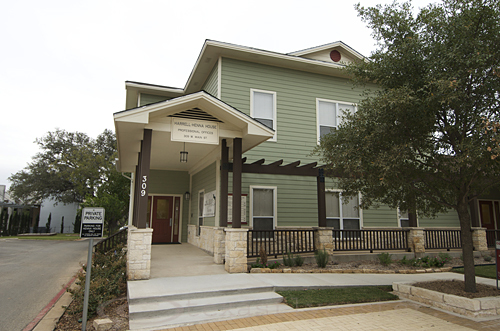 I made a quick, weather abbreviated, trip to Round Rock, and Austin, Texas, to finally visit the new digs of Living Waters Fly Shop late last week and see for myself just what water is left on the Colorado River, San Gabriel and Brushy Creek in Round Rock. As you can see from the photographs, it’s not worth the trip to look at the San Gabriel, regardless of what anyone says – toast. 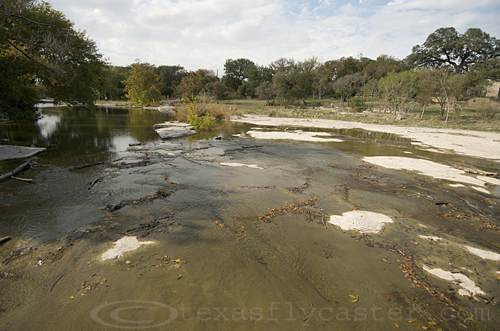 Brushy Creek is still there, with a flow of one to two inches between pools across solid rock. Obviously, there are fish trapped in different pools, and weather permitting they may be fooled. 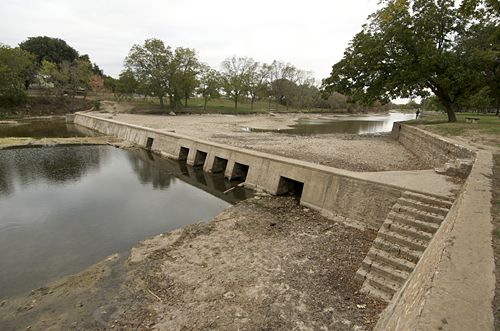 We were also below the dam on the Colorado, in East Austin, and there was water being released there, but a walk in isn’t the way to go. The water is also pretty bad as well. Forget about fishing in East Austin, and stop at Juan in a Million on Cesar Chavez, and enjoy some great Mexican food in a wonderful atmosphere. It was nearly a year ago at the Guadalupe River Trout Unlimited’s Trout Fest that I met Chris and Emily Johnson, owners of Living Waters Fly Shop in Round Rock. I don’t know about you, but I marvel at just about any new business that survives, then thrives and expands in a new location – especially a mom-and-pop fly shop! The historic Texas drought and dreadful national economy aren’t exactly helping new businesses either, so if it ever rains confidence – Living Waters will be there to catch it. 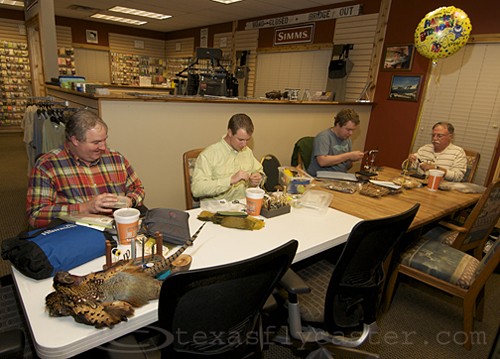 At the heart of what makes Living Waters tick, is their dedication to a large, diverse and dedicated fly tying community. I was talking to Chris about the phenomenon – a vibrant, weekly gathering of fly tiers at several different locations around Austin. “We have tiers of all ages, men and women, and some of the kids are really talented,” he said. “We meet every Thursday here at the Shop, and there can be anywhere from four to twelve tiers” on any given Thursday he added. 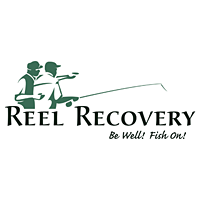 While fly tying supplies line the walls, there are also other items necessary to fly fishing enthusiasts – Simms, TFO Fly Rods, Ross Fly Rods, Dyna-King Vises and a few other brands are represented, and if they don’t have something, I am sure they can get it for you. Having visited their previous location, well off the beaten track, and almost off the radar, I was curious to know how their first few months have been in the new site. “We get a new customer coming in every day! Things are going great,” Emily said. 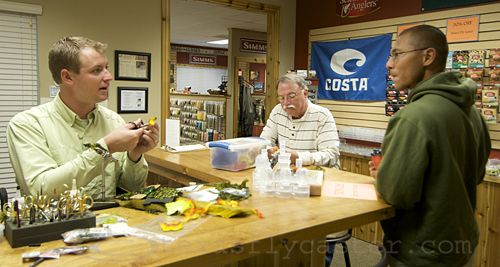 It doesn’t take long to realize that fly fishing and fly tying are in the blood of both Emily and Chris. She has her favorite hooks for favorite flies, and Chris can give and take some teasing while perfectly focused on what’s going on in his fly tying vise – set up along a long table with a Guadalupe bass swimming in an aquarium as a backdrop. “We’re getting a water chiller in soon, and will be releasing the bass and putting in rainbow trout (in the aquarium),” Chris said. I told Chris about my observations that the North Texas fly fishing community seems to lack motivation to tie flies on a regular basis, and that fly fishing in North Texas seems to be on the decline. “I think it’s the water. 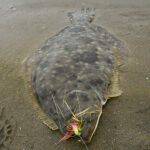 We have clear water down here, and it’s just better for fly fishing,” he said. I think it also translates into fly tying – when you can see the action of your fly, and sometimes even the take. Maybe I am a little “dim,” but that light bulb began to flicker on with that statement. If you have been following along all these years, then you know when it comes to the motivations of Texas Fly Caster, and the DIY Chicken Fried Nation, information is what we’re all about here. I’ve been to fly shops, and done interviews where people talk in code, much like a sketchy SKYPE connection. The flip side is when I don’t know enough to ask the correct, or more detail filled question. For the most part, in this economy, most folks realize the need to float everyone’s boat, and bring goodwill in through their doors. So the vast majority of interviews provide good, accurate information while stopping short of giving out GPS coordinates (unlike me). If you want to get a quick snapshot, feel free to call Chris, and he will answer your questions. He doesn’t fish any private access only waters, so if he can get to it, according to him – so can you. Keep in mind that Chris also guides in this area as well, and includes the San Gabriel, Brushy Creek, the Llano and Guadalupe in his guiding services. Chris also puts out a newsletter update, so be sure to sign up for that e mail as well. It is refreshing to come across a retailer, of any kind, who also makes no bones about their spiritual beliefs. Hey, believe or not, you have to admire anyone who takes a stand and is unafraid to tell people where they’re coming from – right up front. 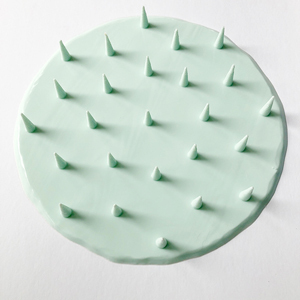 « MRSA – It’s Everywhere! It’s Everywhere!